Alright! Time to try again. Always lots of stuff i'm eyeing on BBTS. Been busy lately, so I'm a bit late to the party. Sharing on Facebook and crossing my fingers. Lots of cool stuff on BBTS I've had my eyes on. Looks really good. I always loved the design of that character. Looking quite good. I especially like the Lord Zedd. I will definitely pick him up if he looks that good in stores. Awesome news. I only wish it could have been released this year to coincide with the first year of the Toyline trilogy. I love the old Filmation Star Trek, but I have a feeling this won't be the same tone if it's mainly directed at kids. I guess I'll hold out some cautious optimism. Always happy for another shot at the contest. Shared on my FB account. So this makes 2 animated TMNT movies right? I'm assuming this is unrelated to the one that got announced for Netflix. Really hoping they will announce some MMPR Zords during Toy Fair. I never grabbed the Bandai Legacy ones and would love a cheaper alternative if they looked good. I'm especially a fan of the original Megazord and Dragonzord. These probably have the best card art out of all the ReAction offerings. Really striking. Hello. I'm here to offer my experience with Rise of the TMNT. 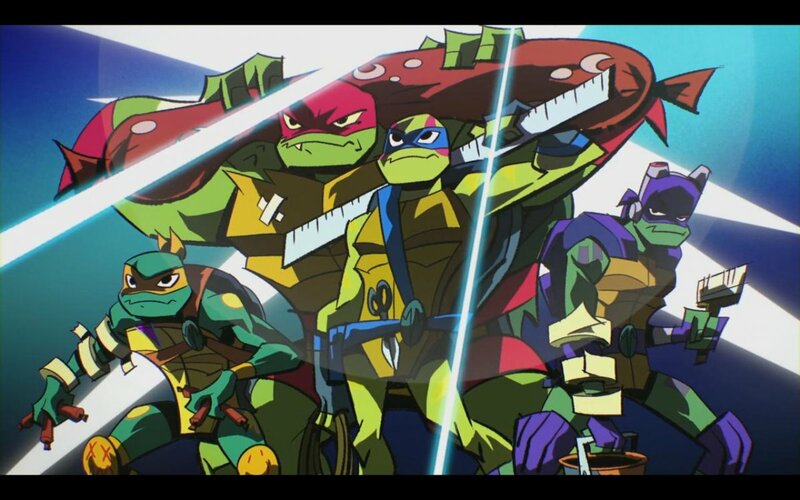 This iteration of TMNT feels somewhere between 1987 & 2003; leaning more with the 80's. It has stylish visuals with 80's type villainy character designs. While there is continuity with the episodes the story line has been average thus far. There are some origin reveals in recent episodes such as "Bugbusters" & "Evil League of Mutants" but the majority of it has been episodic villain encounters with some few character based moments. Visually it's very colorful & energetic very reminiscent of Motor City or the anime works of Studio Trigger. Rise is very easy to plow through since the majority of episodes are only 12ish minutes long & the there's not too much to watch. There's a few full length eps of the 24 min run. I suppose the tone of the show & the characterization of the turtles & Splinter has thrown people for a loop but it has been decent so far. I guess my problems with the show that it may throw too many jokes in too little time with certain hit or misses. It doesn't take much to get an impression of the series tone or characters but here's the eps I recommend. Mystic Mayhem, Repo Mantis, Minotaur Maze, Origami Tsunami, Mascot Melee, Stuck on You, Bugbusters, & Evil league of Mutants. I haven't tried to watch the show yet. I've seen a couple trailers. While I find the character designs a bit off putting I did think the animation looked pretty stylish and fluid in spots. I've actually been watching the 2003 series again recently. Is it worth giving this one a shot? Looks really good. Nice vibrant colors on these. I kind of prefer the Video Game themed figures over the Movie ones. Ya I totally don't remember seeing them in Rebels, but I played them as a class plenty of times in BFII. I looked up the episode they appear in (https://starwarsrebels.fandom.com/wiki/Jumptrooper) and I remember seeing that episode but totally have no memory of them in it. Must not have been paying much attention at the time.